Scott Allan has told Hibernian he would like to join Rangers but no formal transfer request has been handed in. The Ibrox club have had two bids for the player rejected and Hibs boss Alan Stubbs has held talks with the player, who has a year left on his contract. Allan, 23, trained with Hibs on Friday morning and will discuss the situation with his agent later. Rangers manager Mark Warburton would not be drawn on the matter during Friday's news conference. "It's not me avoiding the question, that's what I have to do, I'm paid to do that job," he said. "The other work, the more difficult stuff, is handled by the powers that be. "As a manager I'd be very irate for another club to talk about one of my players. Right now he's a Hibs player and it would be disrespectful for me to say anything about Scott Allan. "Of course he's a talented player but there are many talented players around the country and we have been interested in a number of players. "That one has been documented but right now my job is to focus on the squad of players here. We are always looking. Things happen for a reason with timing. But it's wrong to talk about him." Warburton admitted Stubbs had called him on the matter. "Alan phoned me manager to manager," the former Brentford boss said. "I know Alan from his days at Everton. "I have a lot of respect for him for his football knowledge, his career, and the success he has had at Hibs. I'm very conscious of that. "The conversation was a polite, courteous, manager's viewpoint, which I understand. He gave me his viewpoint on the situation and I said, 'That's great Alan, I appreciate the phone call, I will see you on Saturday'." The Ibrox club are understood to have offered £50,000 more than their initial offer of £175,000 for former West Brom and Dundee United player Allan on Thursday. He scored twice in 42 appearances last season and his eye-catching midfield displays earned him the PFA Scotland Championship player of the year award. Responding to the first bid, Stubbs said in a club statement: "Scott is focused on helping Hibernian to gain promotion this season." 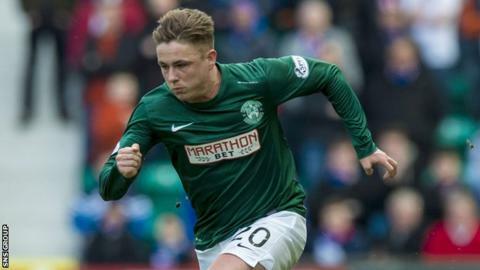 And Hibs chief executive Leeann Dempster added: "There has been a lot of speculation in recent weeks regarding Rangers and their intention to bid for our player. "That bid arrived three days before the two sides are due to meet in the first match of the season. It was an easy bid to reject. "Scott Allan is one of Scotland's best midfield talents and any approaches for him are unwelcome." Hibs host Rangers in Saturday lunchtime's Scottish Challenge Cup first-round tie.